LMS Railway Bridge is a minor waterways place minor waterways place place on the waterways major waterways place village town city on the River Trent (Nottingham Canal) between Meadow Lane Junction (Junction of Nottingham Canal with River Trent) (2¾ furlongs and 1 lock to the southeast) and Carrington Road Bridge (Nottingham) (1¾ furlongs to the west). 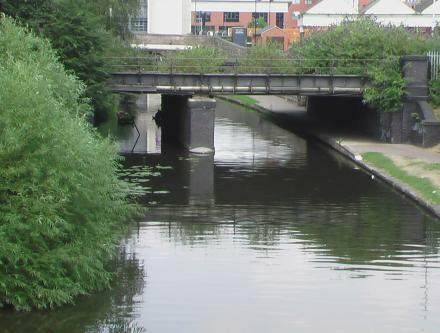 The nearest place in the direction of Meadow Lane Junction is Queen&apos;s Road Bridge; ¼ furlongs away. The nearest place in the direction of Carrington Road Bridge is Station Street Bridge; ¼ furlongs away. Both canal and bridge have plenty of vegetation. Passing on the towpath side of the central pier is recommended. 11-12 South Parade, Market Square, Nottingham, NG1 2LH — 1013 yards to the northwest. 1 Bewhouse Yard, Nottingham, NG1 6AD — 969 yards to the west. Nottingham's City Centre, Nottingham, NG1 2 — 1050 yards to the northwest. 20 Park Row, Nottingham, NG1 6GR — 1366 yards to the northwest. 6 Bromley Place, Nottingham, NG1 6JG — 1250 yards to the northwest. 8 Talbot street, Nottingham, NG1 5GG — 1451 yards to the northwest. 2 Barker Gate, Nottingham, NG1 1JS — 616 yards to the north. Nottingham, NG2 2JY — 1412 yards to the south. Station St, Nottingham, NG2 3BJ — 153 yards to the northwest. Wollaton Street, Nottingham, NG1 5RH — 1418 yards to the northwest. Carrington St, Nottingham, NG2 3AQ — 459 yards to the west. The Unitarian Church, High Pavement, Nottingham, NG1 1HF — 522 yards to the northwest. 48-52 Canal Street, Nottingham, NG1 7EH — 633 yards to the west. 20A Carlton Street, Nottingham, NG11NN — 803 yards to the northwest. Meadow Lane, Nottingham, NG2 3HJ — 622 yards to the south. Bolero Sq, The Lace Market, Nottingham, NG1 1LA — 636 yards to the north. Nottingham, NG2 3 — 357 yards to the west. Nottingham — 459 yards to the northwest. Sneinton — 1093 yards to the northeast. Old Market Square, Nottingham, NG1 2 — 954 yards to the northwest. King Street, Nottingham, NG1 2BH — 1099 yards to the northwest. 15 Queen Street, Nottingham, NG1 2BL — 1136 yards to the northwest. 25 Goldsmith Street, Nottingham, NG1 5JT — 1446 yards to the northwest. Nottingham — 362 yards to the west. Unit 4, The Hicking Bldg., Queens Road, Nottingham, NG23 — 144 yards to the south. Nottingham, Nottingham, NG14 — 1305 yards to the northwest. 5 Broadway, Lace Market, Nottingham, NG1 1PR — 603 yards to the northwest. Pavillion Rd., Nottingham, NG2 5FR — 1052 yards to the southeast. Meadow Lane, Nottingham, NG2 3HJ — 621 yards to the south. Bolero Sq, The Lace Market, Nottingham — 591 yards to the north. Nottingham — 1565 yards to the south. 27-33 Market Street, Nottingham, NG1 6HX — 1239 yards to the northwest. 8-10 Castle Wharf, Nottingham, NG1 7EH — 807 yards to the west. 282-284 Arkwright Street, Nottingham, NG2 2GR — 972 yards to the south. The Cornerhouse, Nottingham, NG1 4DB — 1237 yards to the northwest. South Sherwood St, Nottingham, NG1 5ND — 1318 yards to the northwest. Wellington Circus, Nottingham, NG1 5AF — 1451 yards to the northwest. London Rd, Nottingham, NG2 4UU — 208 yards to the north. 1 St James St, Nottingham, NG1 6BN — 1194 yards to the northwest. Nottingham — 934 yards to the southeast. Nottingham — 595 yards to the north. The Cornerhouse, 12 Trinity Square, Nottingham, NG1 4DB — 1306 yards to the northwest. 26-28 Market St, Nottingham, NG1 6HW — 1203 yards to the northwest. The Cornerhouse, Burton St, Nottingham, NG1 4DB — 1264 yards to the northwest. The Cornerhouse, 29 Forman Street, Nottingham, NG1 4AA — 1300 yards to the northwest. 35-37 Friar Lane, Nottingham — 1064 yards to the northwest. Pavilion Rd, Nottingham, NG2 5FJ — 1037 yards to the southeast. Nottingham — 1071 yards to the west. London Road, Nottingham, NG2 3AE — 84 yards to the northeast.